Dream your Dream…and bookmark it, too! Recent couple of weeks have been very insightful for me from the point of looking at the future. It used to be very vague for me, random ideas not supported by any plans, speculations with myself on how I can achieve lots and so on=) As the year has turned my path into a more or less visible and clear way to go ahead, I now can use this to contemplate my life on a more practical basis. This blog post yet gets us back to the exhilirating DECEMBER 17th, the day of days on our Continuous/Bumpy (c) ELT PD path. During the 1st TeachMeet Int’l Vladimira Mikhalkova @vladkaslniecko gave an insiring – and as fantastically designed as ever – presentation called “Bookmark your dream”. 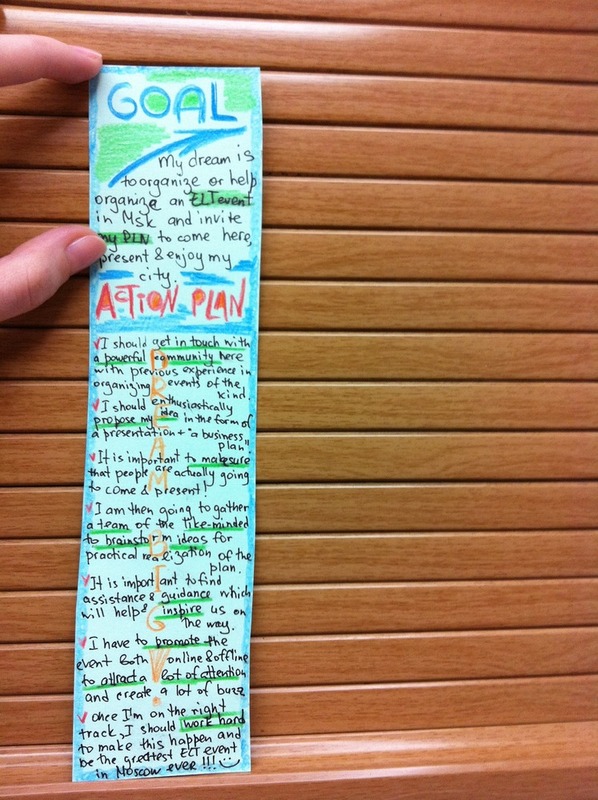 The idea is simple – let your students create a personal bookmark. Give it the sense and meaning. Let it be a GOAL to be reached and an ACTiON PLAN to be followed. The idea appealed to me the very first moment I saw the title, actually=) I knew it had to be something surpr@ising (http://www.surpraise.com), and it proved to be just that! In a nutshell, I’ve had only one opportunity so far to bring this idea to life (the term at the university being over, finals and other boring and bothersome routine things to do). But I’ve had a 1-2-1 lesson with a teenager, 16, with a lot of creative potential as I”ve always seen him. Time for a pic – that’s what he came up with. A decent piece of handicraft I’d say) Another thing is, I was amazed when the boy told me that the way he had depicted the word GOAL is symbolic. I’ll reveal the truth now and i hope you can see the image clear enough to get the proof. G’s image stands for giving FORCE/POWER and DIRECTION to him to fulfill the plan. L’s image stands for the MOUNTAIN of a goal he has to climb (you can actually see a little figure of an alpinist there). Should I say, I was impressed! I”ve always believed in the power of creativity, and thanks to Vladimira for giving this great idea to explore its depths! Frankly speaking, I love being part of my lessons and doing tasks with them. That was what I did. 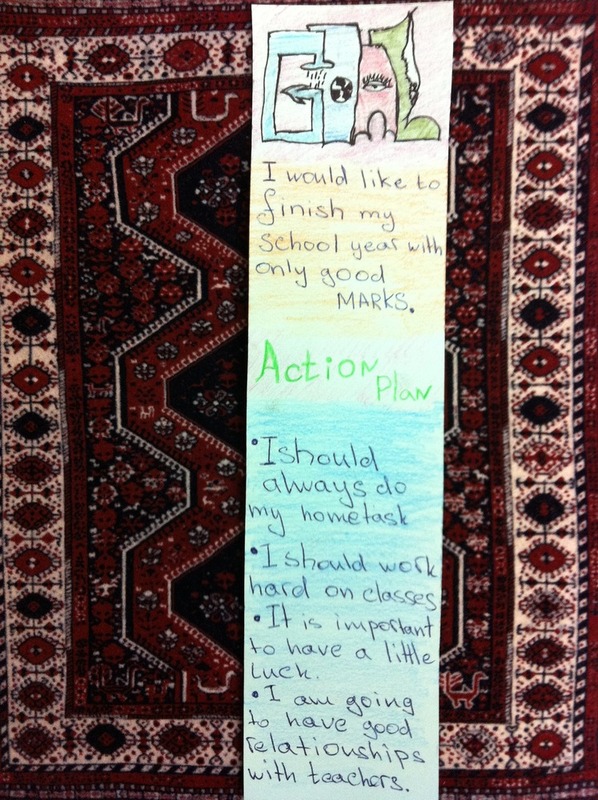 Anton helped me come up with a couple of points for my Action Plan!!! The essense of teacher-student collaboration in action! Thank you for reading my second blog post! This holiday time seems to be a great time to reflect, so I hope you check the FB “In Five Years” page (where quite some of the PLN have already posted, including Chuck and Vladka and Tyson and Ceci and me), Vladimira’s Surpr@ise Page and her presentation “Bookmark your dream” (ask for a link!). I love reading your blogs. Seriously, I do, even though I rarely get to comment on your posts, I devour them with mixed feelings of “Wow, that’s a story, how intelligently put!” and “Why wouldn’t I write some story of my own? This idea I had just after the class/in the metro/falling asleep” and then sadly “Now what was the story anyway?..” Few traces left in the form of separate phrases floating in the mind, gloating at me unable to put them together. (C)rude! Now that there’s this challenge from Adam Simpson @ayearinthelifeof and its counter-challenge posts by Tyson Seburn @seburnt and Tamas Lorincz @tamaslorincz- what a chance to play it back on them (thoughts). Here they are, my 11 blog ideas from 2011 that never turned into real writings. I feel very bad about this particular one. Exceptionally bad. The promises not kept drive me personally mad! And so far as I promised this post to myself a hundred times, and – most importantly – to Vicky..! Maybe it’s a painful story to tell, if I started from the 1st turning point. Then on second thought, I would tell the story of 2011’s crucial first 4 months. Besides, I wanted to share my impressions upon actually implementing many of the ideas from these sessions with my students. Musing on these ideas caused me stay up at night and write down an idea for the early next morning lesson. Transformed teaching. Transormed learning. Definitely out of my comfort zone – and now I”m back to it – wishing to be out of it again and again. “Positive stress” as Shelly put it in her today’s short sk12 webinar. And THESE people!!!! They/you!/ are worth a thousand blog posts!! Well this was intended to become a sum-up on the ways I’ve used web2.0 since April. Edmodo, Wordle, PBworks, Voxopop, Prezi, Muzi, Posterous lately. Feeling my way, not always 1 step at a time (I’m greedy, yes) I’m trying to see what’s working best with whom. And of course, which of these resonate with me and my style of teaching. I think I’m mighty lucky to have met Elizabeth! This is a chance out of a hundred! if I start telling the whole story “of us” now – i would not be able to stop myself and that’ll be a post then;) But I”m in ”11 from 11 not happened”, so – only hints. Elizabeth finds me on the website I created for my chair. There’s a flash of idea. I go to Paris. The idea caught and harnessed. Just my contemplations on the project (which is MORE than a project, actually!!!) which has played its part in turning my life inside out and upside down! Opening doors! Honestly, the mere idea of dogme is almost seductive to me! It is appealing, it is challenging, it is tantalizing. It is just the way I want to go! But since I started to pay conscious attention to what I’m doing – I wanted to share two episodes of my teaching practice. One of them – an in-company business class and how we reacted on a change around us. My first ever experience of an international ELT conference was going to be non-participant. BUT I got this letter from (!) Bethany Cagnol asking me if I”d like to present a poster. I am very shy, you have to know! I’m not very confident. I was..scared? yes! Well this came as unexpected as it could! I was searching for some kind of a very old document I used while at university, and I found a file named “holden story mine”. It turned out to be a lot of fun)) and pleasant memories of university years! Where I enjoyed my reading classes immensely (among some other creative ones). “The catcher in the rye” for long remained in my top list of great books, read not once. I won my third phonetic contest with it. I’m an enthusiast and I’m doing my very best to shake up the stagnant reality of where I happen to be happy teaching (paradox!). The idea is – doing ESP for would-be physicists in the official concept of my chair and its published programme implies READING and TRANSLATING texts. Oh, very funny. Facepalm for me and my students. We don’t agree to do that) – so much. So I’ve come up with some alternative versions of dealing with texts, so far as we still have to use them in such an abundance. Mindmapping, grouping, organizing ideas, debates and my favourite kind of debate) Different ways to get along with a text. And an upcoming presentation (out of comfort zone again, by free will)) at TeachMeet Int’l December 17th. That’s about it. Now I know the secret – patience and persistence.